The next in the Series of “Learn to Cook Indian Food”, it is going to be about cooking Rice in different ways on stove. This is a post I wrote for BeyondCurries many years ago. Thought I will share it again here as a continuation of the series. 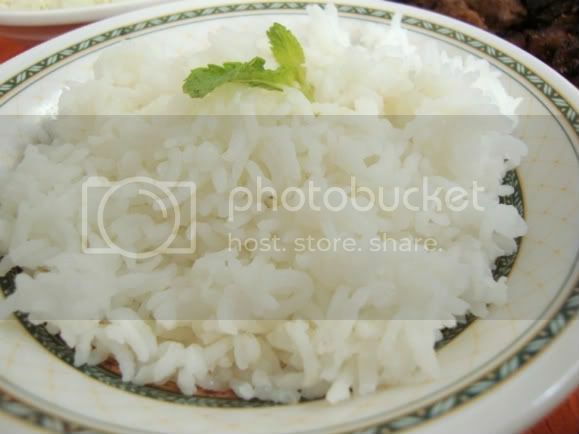 Rice is one of the main staple foods in India. I have personally heard many say that a meal is not complete without rice. This grain gets disguised in many forms and ways. We even have our breakfast items done with rice, like the Idlis and Dosas. One cannot ignore the major part it plays in being the center of attraction. The typical thali from South India, revolves around making dishes that one has to eat with Rice. If we have the thali from Andhra, we have dishes like Katti Pappu (Seasoned plain Dal), Podi (Spiced Gun powder), Urugai (Pickle), Vepudu (Dry Veg saute) followed by any variety of Pappu (Dal), Chaaru (Watery Dal), Perugu (Curds/Yogurt). These days you are offered a variety of Masala Rice as part of the Thali too. All the gravies or side dishes are mixed with Rice and eaten. Rice being so important in a meal, it’s obvious we end up cooking rice in different ways. For the technicalities, let’s discuss the types of rice. We have Parboiled and Raw Rice. Parboiled rice is where the grains are boiled with the husk and then processed. You can check out the vast information available over the net on the Parboiled process and its benefits. Today’s post will brief about cooking Raw Rice. Rice is cooked by either boiling or steaming. In the process, rice absorbs water during cooking. You can cook the rice in just as much water as it absorbs, or in a large quantity of water, which is drained before serving. There are many methods to cook the rice. We can cook the rice in Pressure cooker, Electric cooker, Microwave, or even directly in a pan. Rice may also be made into rice porridge (also called congee or rice gruel or kanji) by adding more water than usual, so that the cooked rice is saturated with water to the point that it becomes very soft, expanded, and fluffy. Rice porridge is commonly eaten as a breakfast food in certain areas, and is also a common food for the sick. Before any method of cooking, it is always good to soak the rice. 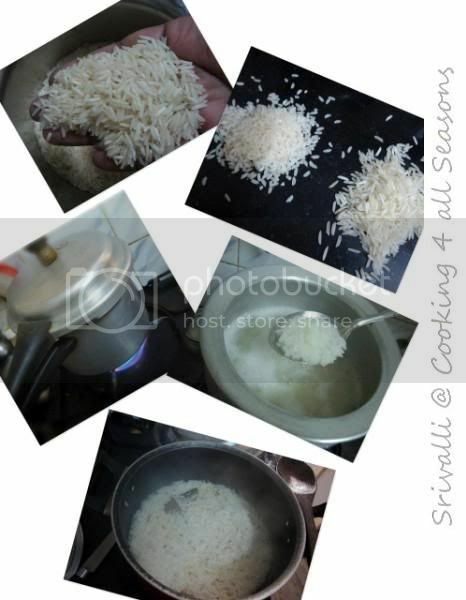 So depending on the type of rice, wash it well and soak it for minimum 15 minutes. Soaking helps in cooking the rice faster, saves fuel, minimizes exposure to high temperature and thus decreases the stickiness of the rice (and also increase the volume of cooked rice to some extent). In some varieties, soaking improves the texture of the cooked rice by increasing expansion of the grains. When I start my cooking, soaking the rice is the first thing that gets done. By the time other dishes are half way, the rice is well soaked to get cooked fast. This again will depend on the type of rice you are cooking. I use Sona Masuri or Ponni when I am making Dal or Sambar. For making Pulao/Biryani/Ghee Rice/Masala Rice, I use Basmati. So you got to decide for what you are going to serve the rice with.When the rice is served with dal or gravy dishes, the measurement of water will be about 2 cups of water to 1 cup of rice, plus 1/2 cup of water extra. This ensures your rice is soft even when packed for lunch. When you are cooking and serving it right away you can use just the 1: 2 ratios. Again seasoned rice like Lemon Rice, Pulihora and others, require the rice grains to be separate. So the rice should not be soggy / sticky. There are two ways of cooking in pressure cooker. First is by using the bowls that come with the cooker, second is cooking it directly in the pan. In the first method, you fill the bowl with rice and water and place it in the cooker filled with water. In the end you will get more grainier texture to the rice. In the second method, the rice is placed directly in the pan with the water. This way the rice becomes softer. Keep an eye on the cooking time as otherwise, the rice will get burnt. Once the rice and water is placed in the cooker, cover it with lid. The steam starts coming out when the water starts boiling, that’s the time when the whistle has to be placed over the value. For regular rice, we can allow 2–3 whistles. But this again depends on your rice and cooker make. In this method, we first boil water, four times the quantity of Rice. If you are cooking 1 cup of Rice, boil about 4-5 cups of water. When the water starts boiling, add the washed rice and cook with a partially closed lid. By placing a lid partially covered, we save fuel and also get the rice cooked faster. But ensure that you keep an eye on the lid, else the water will spill out. Once the rice is cooked, cover the vessel with a plate and tilt it over another vessel to let the water drain out. The excess water is also consumed by adding salt and other seasoning. This is called the kanji and can be given to infants too. Most people down South cook their rice this way to remove excess starch. 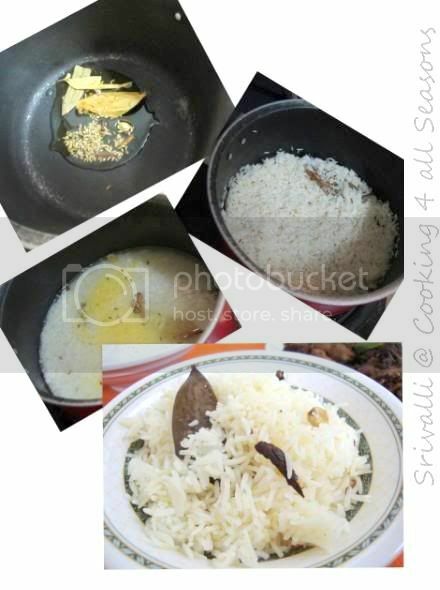 When you cooking rice for making fried rice or other South Indian variety rice dishes like Lemon rice, Pulihora etc, the cooked rice has to be separated or non sticky. This can be achieved by cooking it with 1:2 cup rice, water ratio. This is normally cooked in a pan to ensure the rice retains its shape and is still half done or else you can use electric rice cooker. If you are using pressure cooker, keep it for lesser whistle. When cooking rice to be served with Masala gravies or other rich dishes, the rice is sautéed in butter/ghee and then flavoured with whole spices. 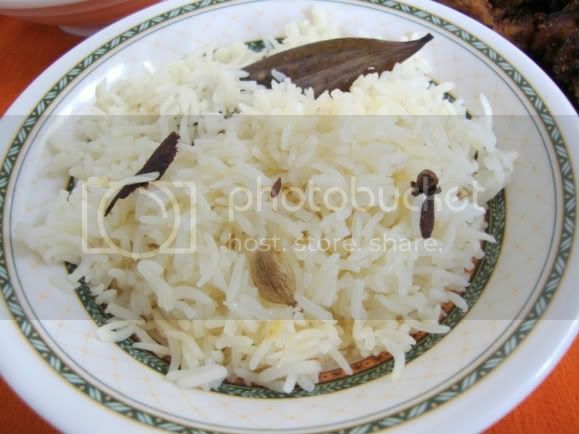 This makes the rice very aromatic and a great dish to be eaten as such too. Heat a pan with ghee. Sauté the whole spices. Then add the drained rice. Sauté well in the ghee. Add water, salt. Let it boil. Check in between once to mix it well. Then again cook with the lid covered. Once it’s cooked, switch off the flame and the rice can remain in the pan for 5 more minutes. This way the rice gets done well. Replacing 1/2 cup of water with diluted coconut milk will increase the flavor. When you are cooking Basmati rice, it’s normally advised to handle with care. It can be washed maximum once or twice. And soaked in the same water you are going to cook. When cooking, it has be to sautéed very gently so that you don't end up breaking the long grains. When cooking for fried rice, the rice has to be cooled to get the grains separated. This can be done by sprinkling a tsp of oil/ghee. Apart from these spices other whole spices like mace, star anise etc., can also be used.